The Society for Science & the Public invites you to be a part of the world's Premiere Global science competition. The Education Outreach Day Program will take place on Thursday, May 16, giving thousands of middle & high school students and teachers from across the great state of Arizona a chance to participate in a full day of hands-on science programming. The program encourages students to think critically, work together and get excited about science. Organizations participating in the Education Outreach Day Program will be able to introduce their organization – including career and internship opportunities – to a unique audience of Intel ISEF visitors and attendees. In 2019, we anticipate that over 3,000 local students and their teachers will participate in the program with an estimated 10,000 science enthusiasts in attendance throughout the week. The Society for Science & the Public is proud to provide financial support for schools that might not otherwise have the resources to come. The premier global science competition for students in grades 9–12, Intel ISEF provides an annual forum for more than 1,800 high school students from over 80 countries, regions, and territories to display their independent research. 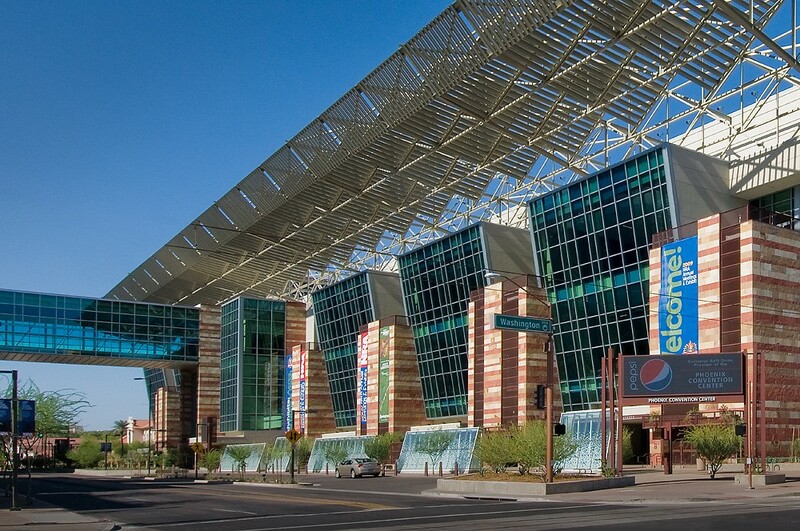 School groups are invited to visit the Intel ISEF Finalist Hall, where they will meet the finalists and learn more about the groundbreaking research performed by their peers from around the world. Participating school groups will have the opportunity to experience STEM from a uniquely Arizonan perspective. From hands-on classroom programming to mobile labs from area museums and organizations, this interactive series of activities will excite and engage students of all ages and abilities. YES! I am interested in participating in the Education Outreach Day Program at the 2019 Intel International Science and Engineering Fair. Classroom Program* Intel ISEF can accommodate classroom experiences for groups between 15 and 50 students. Classroom programs (including any presentations or performances) must be able to accommodate a minimum of 15 students per session. Preference is given for hands-on programs that last less than one hour and can engage in multiple sessions (up to four). Mobile Classrooms, Labs & Exhibit Booths* Intel ISEF can accommodate mobile classrooms or labs in our large exhibit hall space. These interactive experiences should either serve a large capacity of visitors on a rolling basis, or accommodate a minimum of 15 participants per session for multiple sessions. For other interactive displays or informational programming, the exhibit hall will also have free booths available for interested exhibitors. There is a limited budget for fee-based programming, and preference will be given to programs with little or no cost. 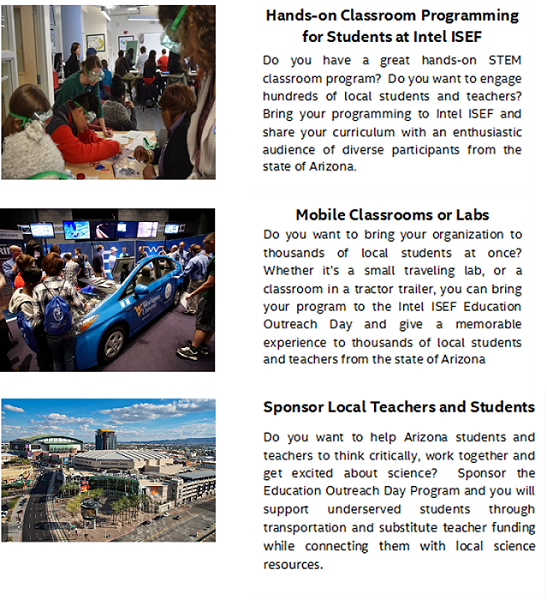 Sponsor Local Teachers and Students Your financial support will help provide transportation and substitute teachers for qualified Arizona school groups to attend Intel ISEF. Interested organizations and individuals will be able to connect with our Advancement team to learn more. Would you like to participate but don't know what sort of activity to do? We can help! Please check the box below if you would like us to share some ideas for demonstrations you can do at your booth or workshops you can do in a classroom. If you have any questions or need additional information, please contact Victor Hall at the Society for Science & the Public. Priority consideration will be given for forms submitted before Jan. 18th, 2019.